When the next Ford Shelby GT500 Mustang was confirmed by the automaker at the 2018 North American International Auto Show earlier in the month, the company’s claims of “over 700 horsepower” sounded perfectly reasonable. Remember: the last time we saw a car wear the “GT500” moniker, it delivered a claimed 662 horsepower at the crank. Chevrolet’s current Camaro ZL1 pumps out a hearty 650 horsepower, and of course, Dodge’s SRT Hellcat variants of the Charger and Challenger produce 707 horsepower apiece. But of course, there’s a possibility that the forthcoming Shelby GT500 could make much more than 700 horsepower, and there’s some indication that this could be the case. 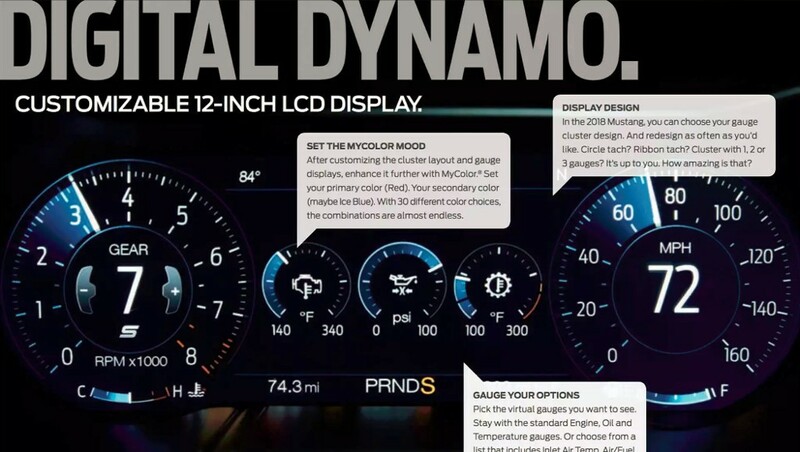 An observant Reddit user by the name of FireflyOD managed to spot a manufacturer photo from the 2018 Mustang’s brochure that depicts a readout from the pony car’s new available 12-inch digital instrument panel showing 7th gear and 72 miles per hour – 7-7-2. Knowing Ford’s penchant for putting Easter Eggs in some of its official photos, this could be an indication that the Shelby GT500 will produce 772 horsepower. Of course, it could just as easily not be an Easter Egg at all, but remember that photo from before the 2018 Mustang GT’s power rating was announced that showed 4th gear and 55 mph? That pic was loaded with Easter Eggs, too, like an odometer reference to the Ford Mustang’s birth year (1964.5) and a miles-to-empty reference to the original Mustang V8’s cubic-inch displacement (289), and the 4-5-5 readout came awfully close to forecasting the new GT’s 460 horsepower. If the 2020 Shelby GT500 Mustang were to produce 772 horsepower, that would likely be more than enough grunt to put the Camaro ZL1 and SRT Hellcat in their respective places. Unfortunately, it will be some time before we know one way or another. The gt500 sounds like it’s going to be a great Car. Am I’m glad it’s returning to the top of the food chain. However I would love to see ford put the 475hp 5.0 in the regular mustang gt, swap the 2.3l for the 400hp/400tq 3.0l have a 520hp 5.2l naturally aspirated cross plane crank mach1. I would also like to see ford put the 475hp 5.0 in the new Ford Explorer to do battle with the Durango srt along with the 3.0l ecoboost to compete with the Durango rt. Along with that I would also like to see ford make a sedan on the new cd6 platform with a rear wheel drive setup with awd optional with the 3.0t v6 and the 5.0l v8 options so we will have an answer to the charger. Let it replace the fusion and call it the falcon!